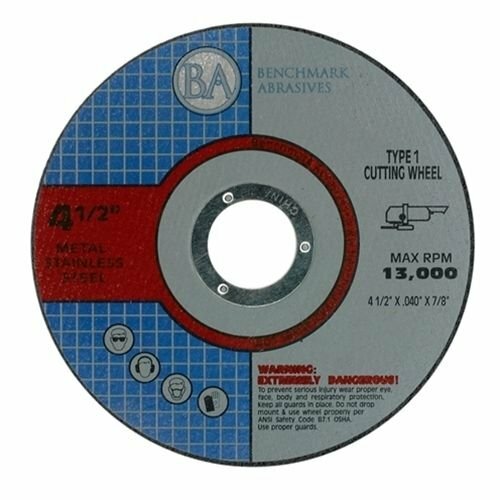 5 pack, 4.5" x 0.045", metal & stainless cutting wheel, 7/8" arbor, thin .045" wheel design for fast burr free cutting, proprietary aluminum oxide grain combination for aggressive cutting action, proprietary material mix ensures durable long life wheels, 2 full sheets of fiberglass for durability & safety, fast burr free cutting. This premium package includes: 50 sheets of sandpaper in 5 different grades: 40/80/120/180/240 grit, 10 pieces each. The sandpaper size is 140mm*90mm, suitable for the 140mm sander. Hook and loop Velcro, easy and quick to stick, durable and practical. Made of high quality alumina abrasive, the sandpaper is durable and antistatic, ideal for sanding and polishing. Come with coarse, medium, fine grades,widely used in the grinding and polishing of metal and non-metal, wood, rubber, leather, plastic, stone, glass and other materials. 40 to 320 grits: for heavy duty removal or woodworking. 400 to 800 grits: for finishing high gloss clear coats. MEETS ALL YOUR NEEDS - Including 10pcs of each grit: 40, 80, 120, 240, 320, 600, 800, total 70pcs. HOOK & LOOP - Easy installation and removal, also will not fall off when installed in use. GREAT DURABILITY - Made from premium aluminum oxide, delivering fast and long lasting sanding. DUST FREE - Pre-punched 8 holes for dust pickup, don't need to worry about dust management. EASY TO IDENTIFY - The grits of the sanding discs are printed on the backside for easy idetification. This is a perfect package of 100pcs sandpaper and 1 sanding pad with shank and 1 sponge cushion that can meet your diverse needs! 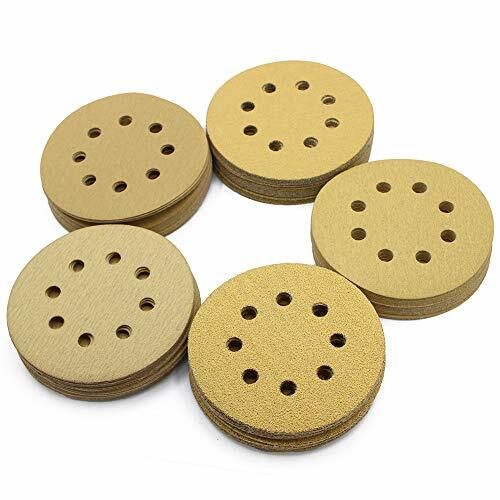 Size: Sanding paper: 2 inch/50mm Sanding pad: 2 inch/50mm Shank: 45mm * 6mm Cushion: 2 inch/50mm Specifications: 80grit; 100Grit; 180Gri; 240Grit; 600Grit; 800Grit; 1000Grit; 1200Grit; 2000Grit; 3000Grit (10 each) Package Included: 100 sanding paper 1 sanding pad 1 shank 1 sponge cushion Very durable and practical, clean and polish perfectly, great for general polishing, and can make semi-rough surface smooth. The kit works better with polish agent. This is a perfect package of 100pcs sandpaper and 1 sanding pad with shank and 1 sponge cushion. Perfect for cleaning and polishing,they can be used with polishing agent to create a smooth surface. Great for general polishing, and very flexible, to make the rough surface smooth and shiny. 3000 grit sandpapers are random color. 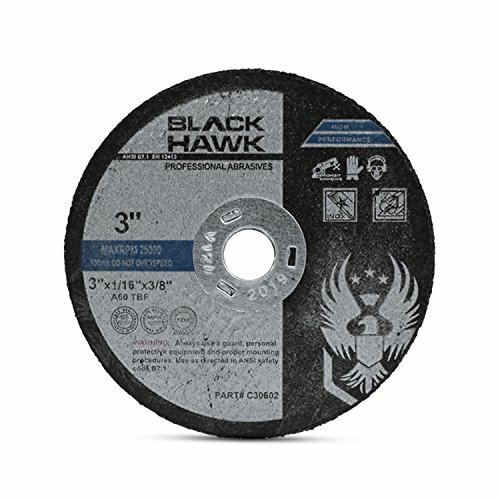 3" x 1/16" x 3/8" Cut Off Wheels by Black Hawk Abrasives are built to last even through the most aggressive metal cutting applications. 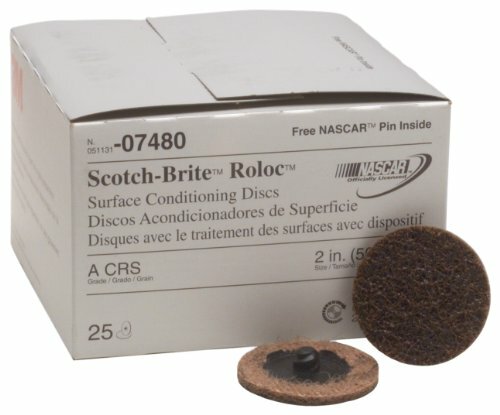 These discs boast a 1/16" (.0625") thickness making them more stable, durable and long lasting. 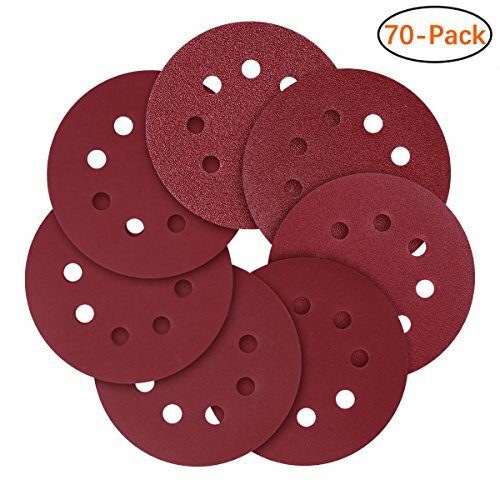 Additionally, these discs are made with premium aluminum oxide grains for fast cutting and double reinforced fiberglass mesh for additional safety. Each disc is affixed with a 3/8" metal arbor for increased security during use. 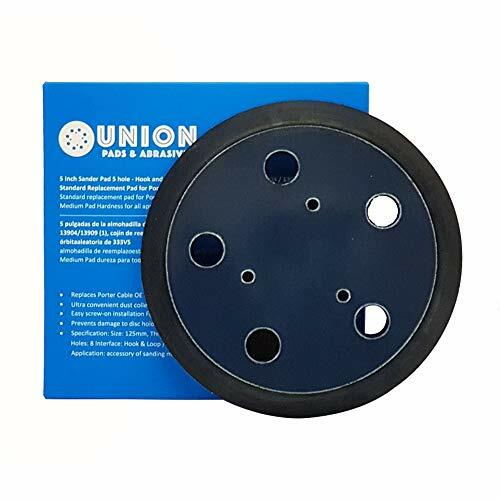 These discs are designed to be used on a die grinder, air cut off tool and/or electric cut off tool and thus are ideal for cutting in confined spaces or at odd angles. These discs are capable of cutting iron, steel, stainless steel, and fiberglass as well as all other ferrous metals. 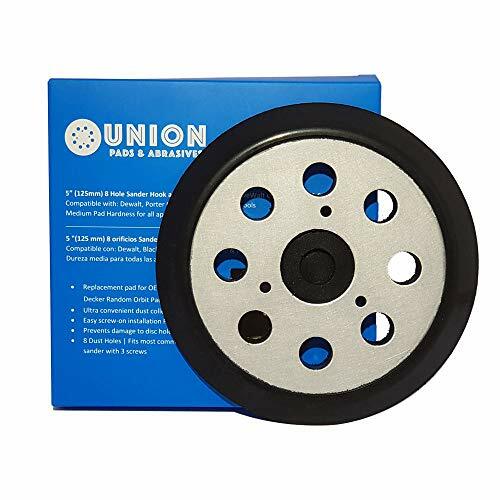 Common uses of these 3 inch cut off wheels include but are not limited to cutting bar stock, rebar, auto body frames, exhaust pipes, stainless steel tubing, and rusted bolts. Don't be fooled by poorly constructed, cheap imitations claiming to offer you the same level of quality. These cut off wheels have been engineered to stand up to stringent European standards. In tests the product has performed as well as or surpassed many of the most recognizable brand names in the construction business, worldwide. Why pay more for the same quality? Our high performance, high quality cut off wheels offer a long service life, require less force to complete each cut, vibration free cut and maximized cutting capacity at a fraction of the cost. QUANTITY: This listing is for a pack of fifty (50) pieces of our 4-1/2" cutting wheels. DIMENSIONS: Each disc is four and a half (4.5) inches in diameter with a 7/8 metal center and .040 thickness. These are Type 1 (flat) discs. 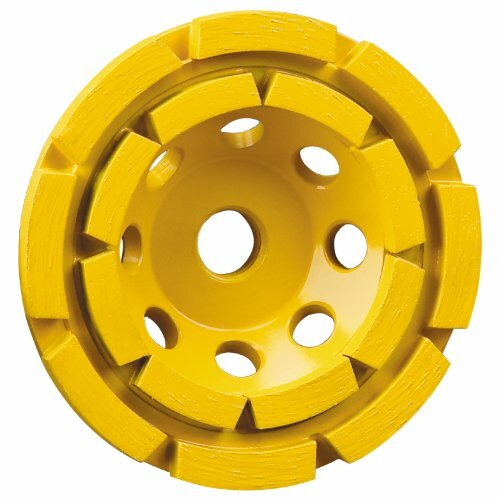 USE: These cutoff wheels are designed for cutting fiberglass, steel, iron, plastic, stainless steel, and other ferrous metals. INFO: Our cutting wheels are made with a proprietary blend of premium abrasive grains. These grains are self-sharpening and provide an aggressive cut. SAFETY: Wear all applicable safety gear when using these discs (eyes/ears/face/hands/body/etc). Sanding Discs in 8 different grades to meet almost all your general polishing needs. 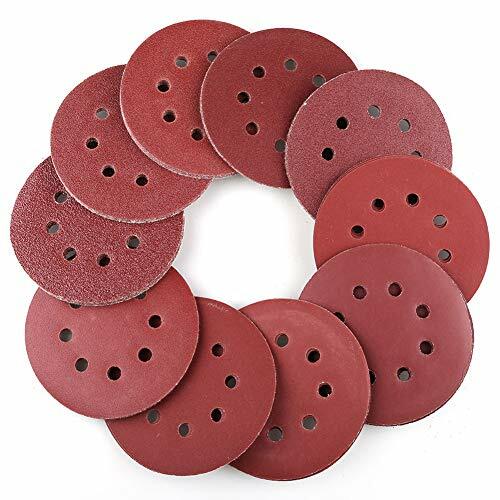 Sanding Discs are made from high quality alumina abrasives, durable and antistatic. 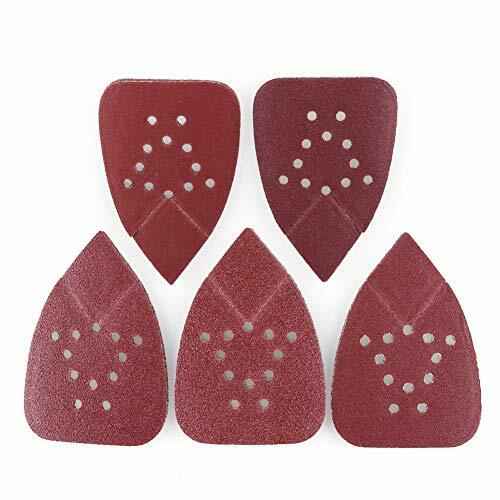 These Sanding Discs are suitable for the 8-hole hook side with a Velcro sanding pad. Please clean the dust and replace the old Velcro sanding pad before use. If you have any questions, please leave us a message, we will reply as soon as possible. Do not hesitate to order! You will get a great set of sand discs. 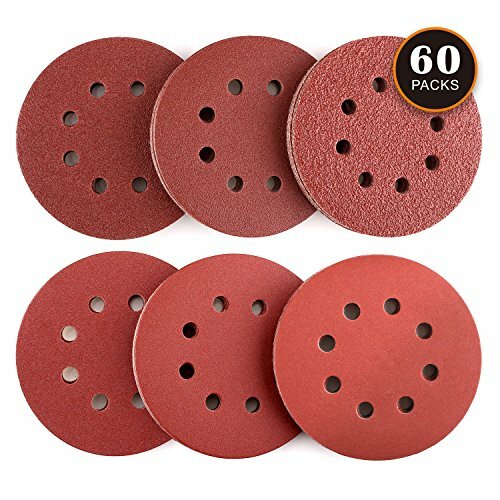 This premium package includes: 80 sheets of Sanding Discs in 8 different grades, 40/60/80/120/150/180/240/320/ grit, 10 sheets each. Sanding Discs are 5 inches in diameter and are suitable for use in the Random Orbital Sander. Velcro backing, easy to stick to the Random Orbital Sander, easy to remove without any tools. 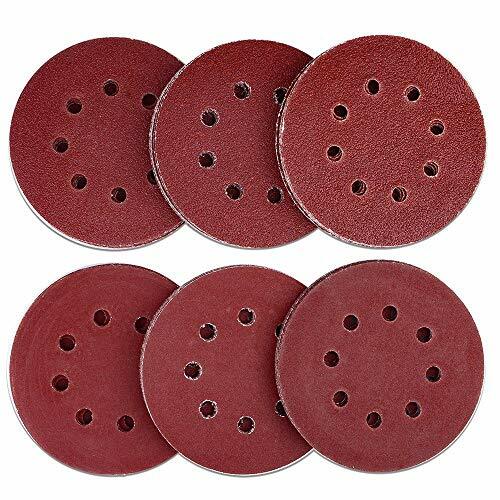 Made from high-quality alumina abrasives, Sanding Discs are durable and anti-static, ideal for sanding and polishing. Widely used in the grinding and polishing of metal and non-metal, wood, rubber, leather, plastic, stone, glass and other materials. LotFancy sanding pads efficiently deliver smooth results and are quick for removal and replacement, adding up to more productivity while offering better surface finishes. Best uniform polishing lines effect. Generally used for automobile and accessories, electric, paint, aluminium alloy, metal, plastic, wood etc. We offer various sizes and abrasive types. 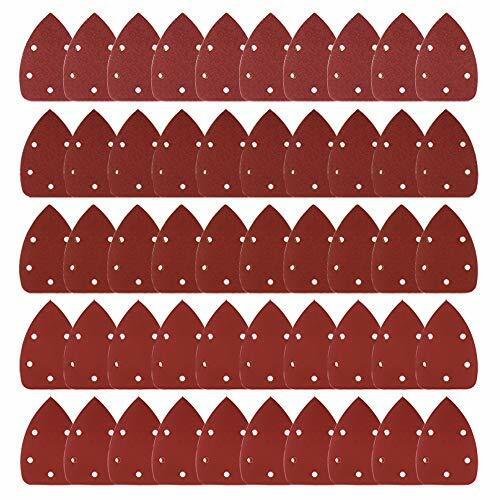 The sandpaper assortment is perfect for professionals, homeowners, and hobbyists because it includes abrasive range from 60-grit to a nice 220 finishing grit. This is an O.E.M. authorized part. Fits various Porter Cable models. OEM Part Number 13904. Made in United States. 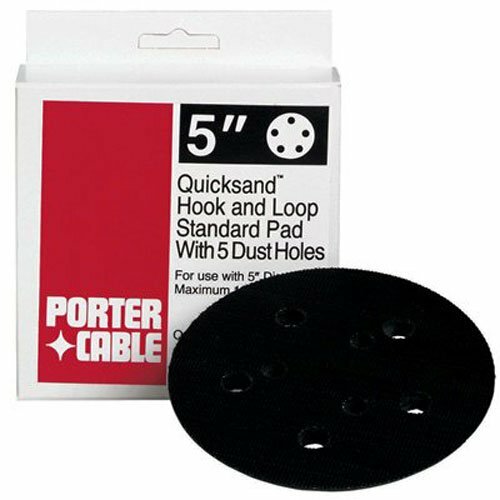 Prevent damage to your disc holder with the Porter-Cable 13904 5-inch hook-and-loop pad, the standard replacement pad for the Porter-Cable 333 random orbit sander. Enjoy the convenience of the five-hole dust collection feature and easy screw-on installation using the screws of your sander. 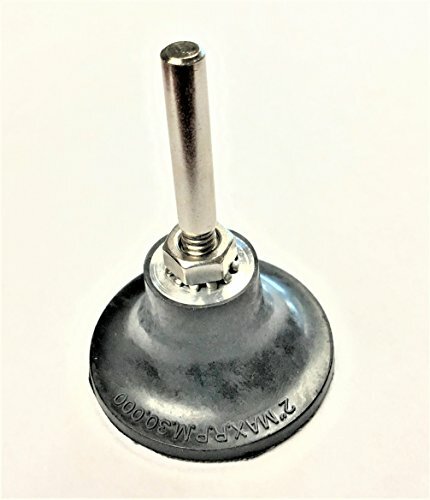 The hook-and-loop pad accommodates 5-inch hook-and-loop discs and is sold individually. Use for cleaning and finishing on all metals for removal of light rust, oxides and coatings. 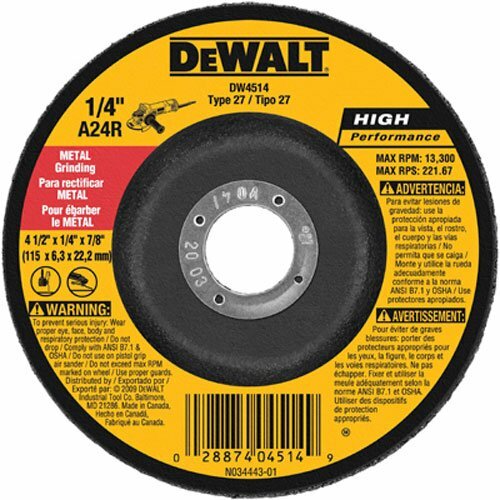 The DEWALT DW4514 heavy-duty 4-1/2 x 1/4-inch metal grinding wheel takes care of the toughest grinding jobs with its high performance aluminum oxide grain and three-sheet fiberglass construction. Its aggressive grain concentration (A24R grit) allows for these grinding wheels to handle heavy-duty grinding of ferrous metals (steel, iron welds, edges), weld blends, stainless steel, and hard alloys. 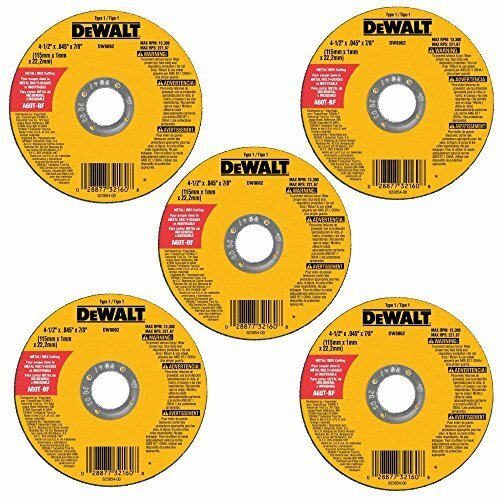 DEWALT uses a proprietary material in these grinding wheels to ensure long life and consistent performance. 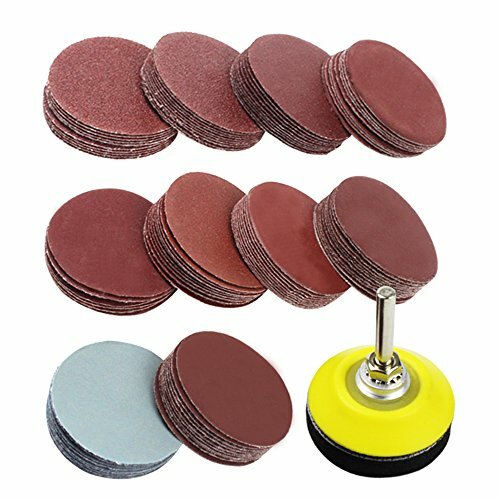 2-diameter holder for roloc-type discs and pads - excellent quality, made in Taiwan, heavy-duty rubber pad, aluminum core with nickel-plated removable steel shank, 1/4 shank fits power drills, die grinders, air grinders and other power tools, accepts sanding, polishing, surface conditioning/preparation, bristle and other disc consumables, rated 20, 000 rpm, 1-1/2l shank, overall height 2-5/8, 2.5 oz. Also available in 3 diameter. LotFancy sandpaper sheets are made from aluminum oxide, designed for high speed sanding and heavy duty removal, delivering fast and long lasting service. Ideal choice for sanding and polishing. 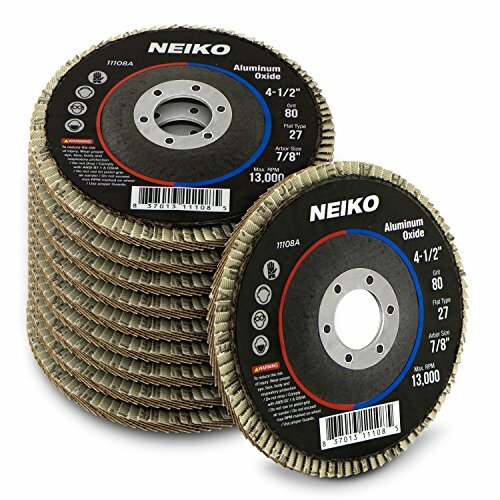 Sanding discs are made from aluminium oxide abrasive, durable and anti-static. The grit is larger, the polish effect is finer. Suitable for using with random orbit sanders. Hook and loop backed, and pre-punched with 8 holes for dust extraction, easy to use. Need to add sandpaper glued to the sticky adhesive disc to disc fixed polished. You should add converter when it's applied to an electric drill. 6 kinds with different degrees of use (40 # 60 # 80 # 120 # 180 # 240), can bring you a perfect cleaning and polishing effect. 5 inch diameter, suitable for use with random orbit sanders; Pre-punched with 8 holes for dust extraction, easy to use. Tacklife sanding disc set are made from aluminium oxide abrasive, durable and anti-static. Apply to metal and non-metal, wood, rubber, leather, plastic, stone, glass and other materials grinding, polishing, derusting and so on. 1. This sandpaper is a dry grinding product, not water spray or wet grinding. 2. The sandpaper is best stored in a dry and ventilated place, damp will affect the product life. 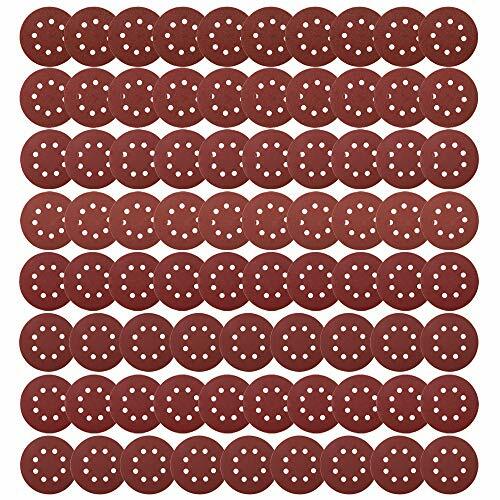 We all know that the grit is larger, the polish effect is finer, LotFancy Sanding Discs assorted pack including 40/60/80/100/120/180/240/320/400/800 grit, 10pcs each grit, can maximally satisfy your polishing requirements and achieve a good sanding effect from rough to fine. Durable Aluminum Oxide Sand Paper is good choice for grinding and polishing of metal and non-metal, wood, rubber, leather, plastic, stone, glass and other materials. The Round Sanding Sheet can use in many domains: automotive, industrial, woodworking, marine. Hoop and Loop Sanding Pads make easy for installation and removal, simplify your work.